jetPRIME® is a powerful and versatile DNA and siRNA transfection reagent for day-to-day experiments that leads to efficient and reliable scientific results. jetPRIME® ensures high DNA transfection efficiency and excellent gene silencing in a variety of adherent cells. jetPRIME ® is also ideal for DNA/siRNA co-transfection or co-delivery of several plasmids. Furthermore, our jetPRIME® reagent is very gentle on cells since it requires low amounts of reagent and nucleic acid during transfection. 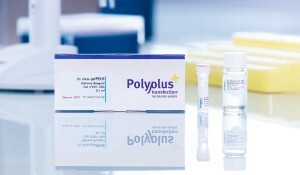 1.5 ml is sufficient to perform ca.375 transfections in 6-well plates. Bulk quantities are available upon request. Please contact us. jetPRIME® is a powerful transfection reagent for day-to-day experiments. It leads to unusually high percentage of transfected adherent cell lines of various origins as well as primary cells. Superior transfection efficiencies ranging between 70 and 90% were obtained with jetPRIME® reagent versus the top competitor’s reagent for several commonly used cell lines (Fig.1 & Fig.2). Fig. 1: Comparative transfection efficiency of jetPRIME versus its main competitor. Transfection efficiency was assessed by FACS analysis in various cell lines 24 h after transfection in 24-well plates. Conditions were used according to the manufacturer’s recommendation for both Lipofectamine® 2000 and for jetPRIME®. Fig. 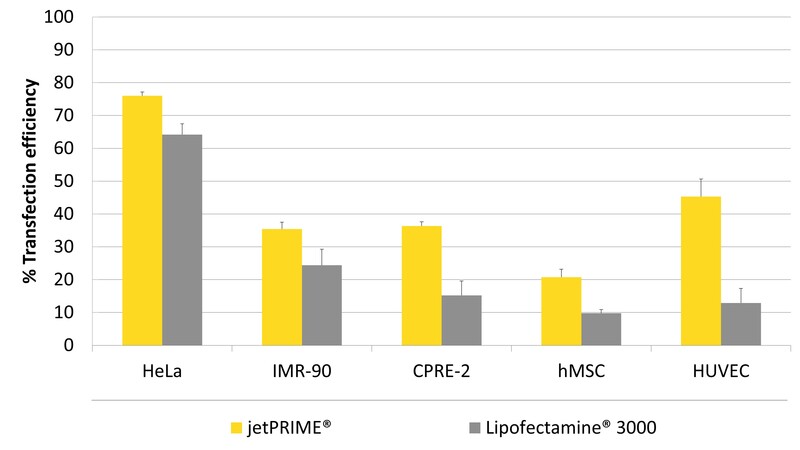 2: Comparative transfection efficiency of jetPRIME® versus Lipofectamine® 3000. Transfection efficiency was assessed by FACS analysis in various cell lines 24 h after transfection in 96-well plates or 24-well plates. Conditions were used according to the manufacturer’s recommendation for lipofectamine® 3000 and for jetPRIME®. 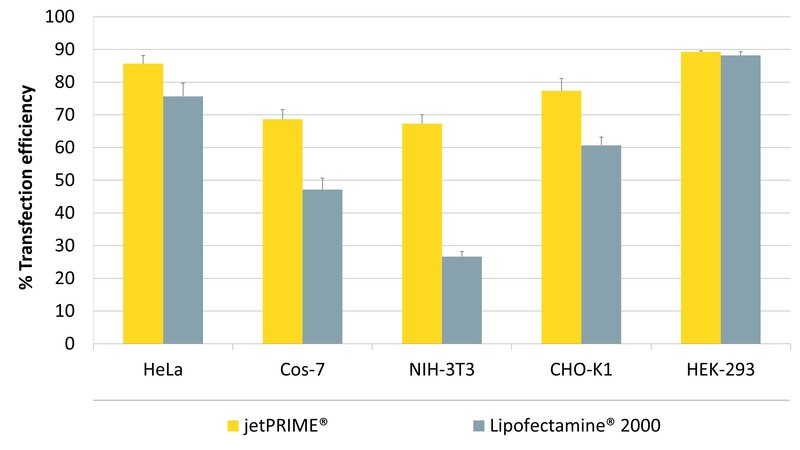 jetPRIME® is a powerful in vitro transfection reagent that requires a small amount of reagent and plasmid DNA, making its use very cost-effective (Table 1). Table 1: Recommended conditions to use. Amounts of DNA and reagent (jetPRIME® and competitors) per well in 6-well plate for transfection according to manufacturers’ recommendations. In addition to reducing costs, using less DNA also minimizes adverse cytotoxic effects triggered by transfection. Hence, jetPRIME® is the reagent of choice for high transfection efficiency with excellent cell viability. jetPRIME® is extremely gentle on cells during transfection leading to increased cell viability and improved transfection results. Cells transfected with jetPRIME® are healthy, while major cytotoxicity is observed with competitors (Fig.3). Fig. 3: Cell viability 24h after transfection. Phase contrast microscopy of HeLa cells 24 h after transfections performed according to the manufacturer’s recommendations for each reagent. Fig. 4: jetPRIME® protocol. Convenient protocol for DNA, siRNA and co-transfection of DNA and siRNA. Take a look at our Expert Tips in Genetic Engineering and Biotechnology News. 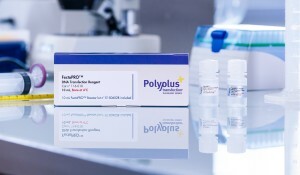 Polyplus-transfection and Greiner Bio-One have partnered to provide our newest educational webinar, « A Different Approach to Achieve a Higher Transfection Efficiency ». Hear the full seminar recording. 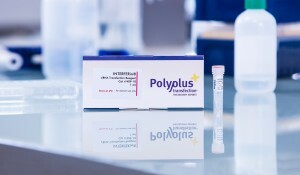 If you have any questions regarding jetPRIME®, please visit our dedicated Frequently asked questions or contact us at support@polyplus-transfection.com. jetPRIME® leads to remarkably high percentages of transfected adherent cell lines of various origin, as well as primary cells (Table 1). 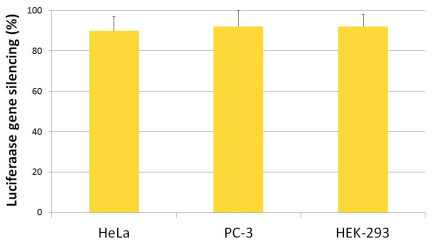 Table 1: Transfection efficiency of various cell types using jetPRIME®. The percentage of GFP-positive cells was determined by FACS analysis 24 h after transfection. Plasmids are small circular DNA molecules that are commonly found in bacteria. Plasmids exist and replicate separately from chromosomal DNA and in bacteria they often carry genes that are beneficial for bacterial survival. Plasmids can be deliberately introduced into desired cells and utilized to overexpress a gene of interest in a specific cell line. This procedure is called DNA transfection and is a commonly used method for studying gene function or protein of interest. The use of the CRISPR/Cas9 system in mammalian cells has recently emerged as a very convenient way to modify the cell genome at a specific locus. It involves transient transfection into mammalian cells of either (a) one or several plasmids coding for Cas9, the specific gRNA and eventually the sequence to be inserted, or (b) a mix of one or two plasmids and an RNA molecule (the gRNA). Available application note: CRISPR/Cas9-mediated gene disruption using jetPRIME®. jetPRIME® transfection reagent is highly effective for routine virus production of both AAV and lentivirus in adherent cells grown in classical media such as DMEM in presence of serum. jetPRIME® leads to over 90% knockdown of endogenous gene expression in a variety of cell lines. 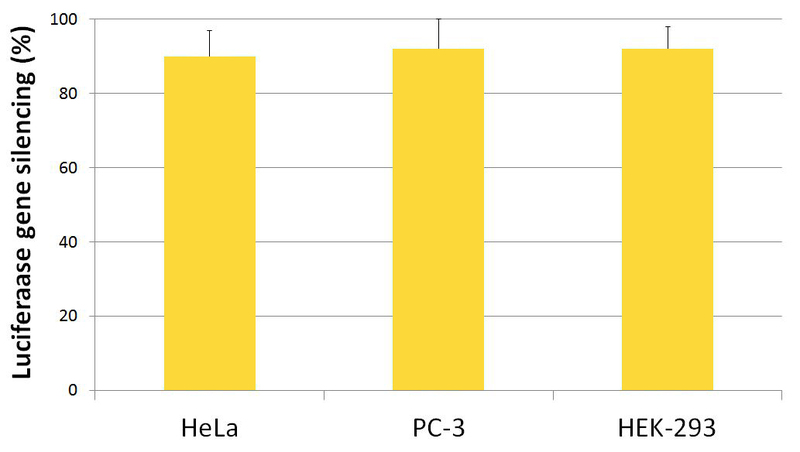 For example, jetPRIME®-mediated transfection of HeLa cells with 10 nM siRNA duplexes targeting endogenous lamin A/C in HeLa cells drastically reduces lamin A/C gene expression to barely detectable level (Fig. 1). Fig. 1: Endogenous lamin A/C silencing using jetPRIME®. HeLa cells were transfected with 10 nM of 21-mer lamin A/C siRNA. After 48 h, lamin A/C silencing was assessed by immunofluorescence microscopy using an antibody against lamin A/C . 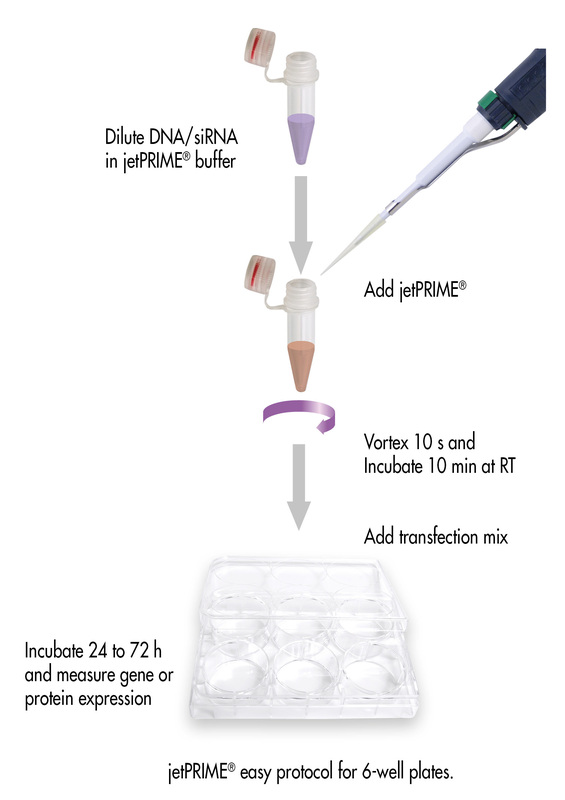 jetPRIME® is well suited for DNA and siRNA/ miRNA co-transfection experiments or co-delivery of several DNA plasmids. We performed DNA and siRNA delivery with jetPRIME® and observed highly efficient gene silencing in a variety of cell lines with very low toxicity. Over 90% silencing is achieved in adherent cells, using 10 nM siRNA (Fig. 2). Fig. 2: Exogenous luciferase silencing in several cell lines after DNA & siRNA cotransfection using jetPRIME®. Experiments were performed with 400 ng p4CMV-Luc and 10 nM of luciferase siRNA per well in 6-well plates. 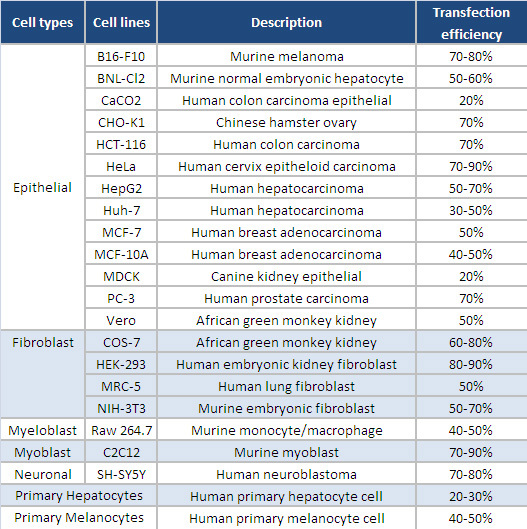 Here is a selection of relevant references using jetPRIME®, more are available in our Polyplus-transfection Database. Charrier, C., Joshi, K., Coutinho-Budd, J., Kim, J. E., Lambert, N., de Marchena, J., Jin, W. L., Vanderhaeghen, P., Ghosh, A., Sassa, T., Polleux, F. (2012).Inhibition of SRGAP2 function by its human-specific paralogs induces neoteny during spine maturation., Cell 149, 923-3. Ichim, G., Genevois, A. L., Menard, M., Yu, L. Y., Coelho-Aguiar, J. M., Llambi, F., Jarrosson-Wuilleme, L., Lefebvre, J., Tulasne, D., Dupin, E., Le Douarin, N., Arumae, U., Tauszig-Delamasure, S., Mehlen, P. (2013). The Dependence Receptor TrkC Triggers Mitochondria-Dependent Apoptosis upon Cobra-1 Recruitment., Mol Cell 51, 632-4. Rodriguez, M. I., Peralta-Leal, A., O’Valle, F., Rodriguez-Vargas, J. M., Gonzalez-Flores, A., Majuelos-Melguizo, J., Lopez, L., Serrano, S., de Herreros, A. G., Rodriguez-Manzaneque, J. C., Fernandez, R., Del Moral, R. G., de Almodovar, J. M., Oliver, F. J. (2013).PARP-1 regulates metastatic melanoma through modulation of vimentin-induced malignant transformation., PLoS Genet 9, e1003. Shi, J., Zhao, Y., Wang, Y., Gao, W., Ding, J., Li, P., Hu, L., Shao, F. (2014). Inflammatory caspases are innate immune receptors for intracellular LPS., Nature 514, 187-9. Thomas, M. G., Luchelli, L., Pascual, M., Gottifredi, V., Boccaccio, G. L. (2012). A monoclonal antibody against p53 cross-reacts with processing bodies., PLoS ONE 7, e3644. “Switching to jetPrime significantly impacted the success of our studies. In comparison to a competitors transfection reagent, jetPrime gives higher transfection efficiency, less toxicity and requires less plasmid DNA. Every batch of jetPRIME® reagent is tested in-house by DNA transfection of HeLa cells with a GFP-expressing plasmid and each vial of reagent is provided with Certificate of Analysis.